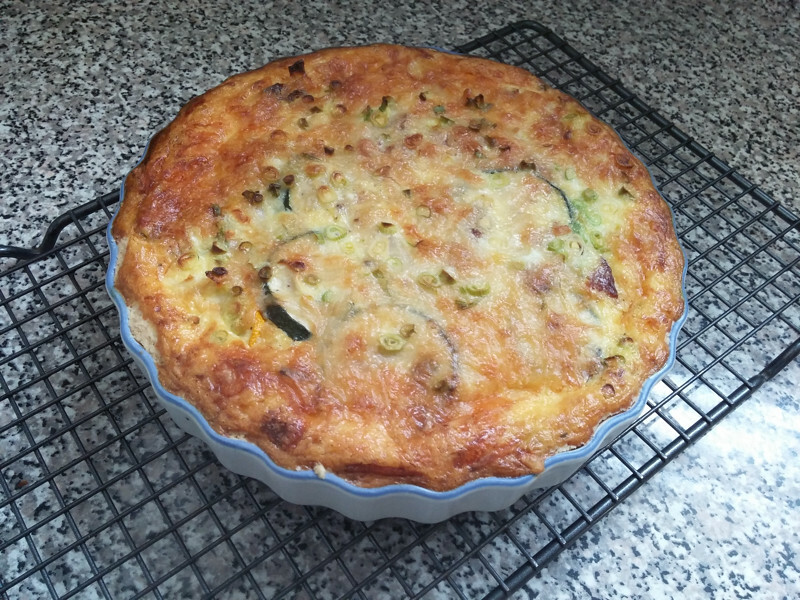 Quiche is one of my absolute favorite things to make and eat. I will never understand people who prefer frittatas because, um, hello?! A frittata is basically a quiche minus the crust, and the best part of quiche is the crust! People are silly. Dumping some vegetables and meat inside an (almost) perfectly laid out buttery crust, whisking up a few eggs with some milk and cream in a bowl and pouring it over top, and then sticking the whole mess in the oven for forty minutes.... making quiche is just that easy! And chances are, there will always be leftovers. So all you have to do the next day is reheat, and eat! Super simple. Super delicious. Super awesome. My go-to quiche is quiche lorraine, which is basically just bacon, ham, and swiss cheese filled. But it's summertime, and we have all these wonderful vegetables at our disposal so I thought I'd make an exception this time and go a different route with my fillings. I had to turn the oven on to cook the quiche anyway, so I figured I might as well roast everything up beforehand for extra flavor. Worth it! Of course, I still added bacon and pancetta because, well, it's bacon! And pancetta! But if you're not keen on either of those things, you can just stop reading this blog omit them and stick with the vegetables. Just ignore the mess that is my kitchen counter in the photo below. That's just how things are done here. Lots of mixing bowls. Egg shells in the sink. A gin cocktail (or two) with lime. A nectarine to snack on after I spill egg mixture all over the counter. It's all good! 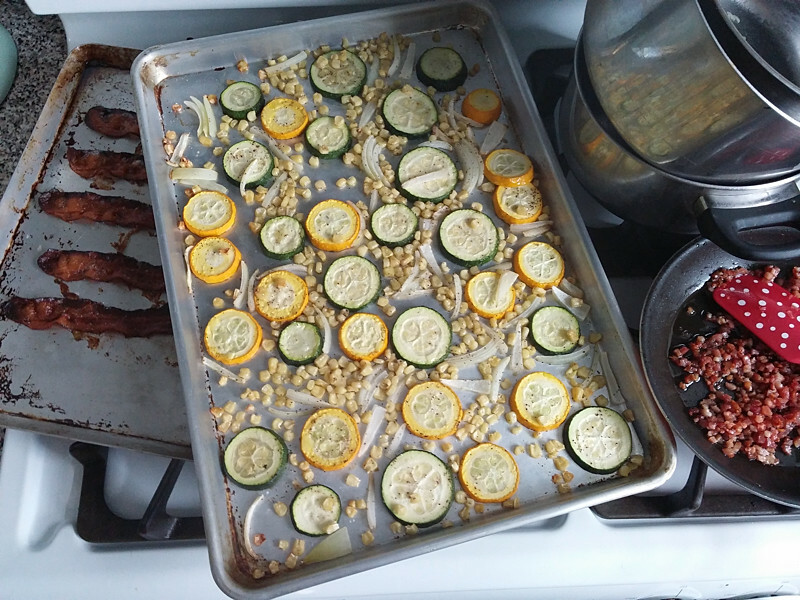 - Slice all your vegetables and spread them out across a sheet pan. Drizzle oil and top with a sprinkling of salt and pepper, use your hands to coat all the vegetables. Roast for 25-30 minutes, or until the vegetables are cooked through and the corn is starting to look crispy. 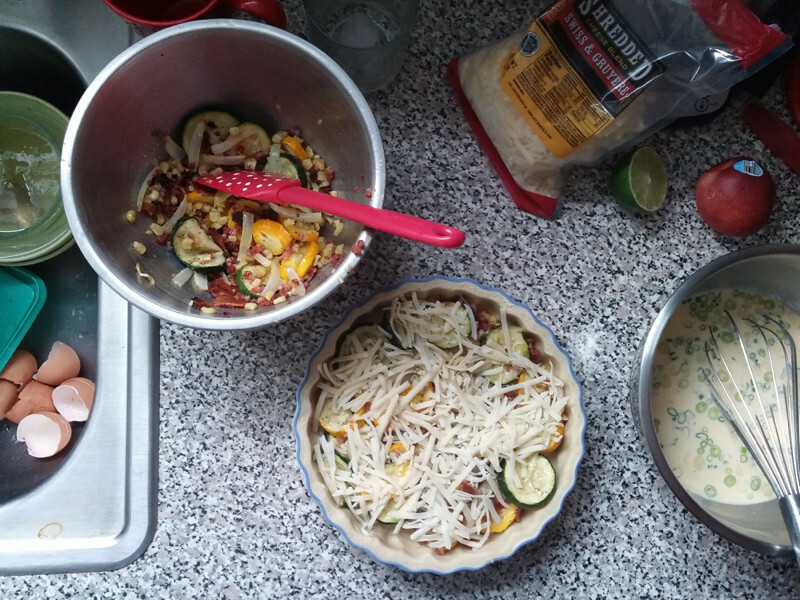 - While the vegetables are cooking, line your pie pan with the pie crust. Trim the edges, or fold them under for a nice thick side crust. Then place the lined pie pan in the refrigerator to set up while you get everything else ready. - Cook your bacon and your pancetta. I cook my bacon in the oven (I lay it out on a sheet pan and bake it for 15-20 minutes), but if you prefer to cook it over the stove, then do that! Cook the pancetta in a small pan on the stove until it's crispy. I also like to drain the fat from both the bacon and pancetta once they're done cooking. Once your vegetables and meats are cooked, let them sit on the stove or counter to cool down slightly. - Turn the oven down to 350 degrees. In a medium-sized bowl whisk the eggs, milk, and heavy cream until thoroughly combined. Add in a pinch of nutmeg, salt, pepper, and the chopped green onions, and whisk some more. In another bowl, toss the vegetables, bacon, and pancetta. Pull the lined pie pan out of the refrigerator and alternate layering the vegetables and cheese until the pie pan is filled. Pour the egg/milk mixture over top (but don't over-fill it like I did, or you'll have a mess on your hands!) and safely transfer the pan to the oven. - Bake for 35-40 minutes, until the center of the quiche is set. Let cool for a bit before cutting into it. Enjoy! 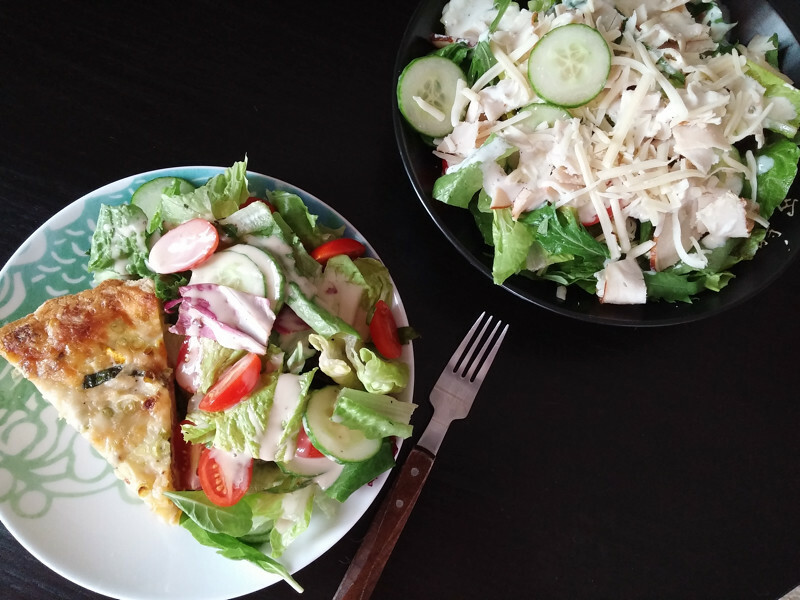 When your husband doesn't want quiche for lunch because he had quiche for dinner the night before, but you could care less because, QUICHE... you find a happy place between quiche and salad that you can both agree on.